PLOT: A lonely Japanese woman becomes convinced that a satchel of money buried and lost in a fictional film, is in fact, real. With a crudely drawn treasure map and limited preparation, she escapes her structured life in Tokyo and embarks on a foolhardy quest across the tundra of Minnesota in search of her mythical fortune. Loosely based on the true story of Japanese woman Takako Konishi, who was found dead near Detroit Lakes, Minnesota in 2001. She had told a local state trooper that she had travelled to the US to search for treasure buried in the nearby snow. It appears that the treasure that Konoshi was hunting was ransom money buried at the end of fictional movie. One of my most anticipated films of this year (along with the equally excellent White God), Kumiko The Treasure Hunter is billed as ‘a Zellner Bros. adventure’ and it certainly lives up to it’s billing. David Zellner takes on writing and directing duties as well as portraying the state trooper, whilst brother Nathan co-wrote and played a born again evangelist masquerading as a travel information assistant. The treasure hunting tale takes us from East to West as Kumiko, a lonely and disenchanted Tokyo office worker tries to add meaning to her hum-drum life. The movie begins with Kumiko following a treasure map into a cave where she discover a video tape buried under rocks. Upon watching she finds that the tape is of the Coen brothers movie Fargo, famous for its (completely fictional) opening slide that states “this is a true story”. Taken this statement as fact (despite the “all characters appearing in this work are fictitious, any resemblance to real persons, living or dead, is purely coincidental” disclaimer) she begins to devote all her spare time to research and creating a map for where the satchel of money is hidden. As her life continues to spiral downwards (her boss, her colleagues and even her own mother see her a failure), she flips and with no real preparation, clothes or money (just a credit card she stole from her boss) she takes a flight to Minnesota and sets off to meet her destiny. Along the way to Fargo she meets some interesting and quirky character such as those played by the Zellners themselves, before heading off into the wild snow with just a stolen hotel duvet to ward off the cold. The film is split 40/60 between Japan and America, with each part distinctly different and equally touching. It is easy to fall for Kumiko’s childlike charm as the downtrodden Tokyo office lady and also for her headstrong international adventurer, mainly due to Rinko Kikuchi’s wonderful portrayal. The other star of the film is David Zellner. Whilst his acting role is minor, he plays the well meaning but simple State Trooper perfectly. But it is his direction that stands out more as he refuses to spoon feed the audience. Using minimal dialogue, the subtitled first part should not be off putting for those with an aversion to reading films and there is enough humour (though the film is not a comedy) to avoid the film becoming bleak. Both uplifting and downbeat, heart warming and heart wrenching, this tale of focussing on something that is so out of focus is right up there as one of my films of 2015. There is a second film based on the story of Takako Konishi, the 2003 documentary short ‘This is a True Story’. I will post a review of that at a later date. 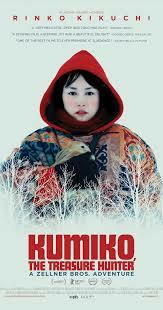 Uplifting and bleak, heart warming and heart wrenching, Kumiko the Treasure Hunter is hidden gold.